OSHA safety training comes from the Occupational Safety and Health Administration (OSHA) which offers various types of training courses and educational programs to help increase awareness about the health and safety hazards in your workplace. You will learn to recognize potential dangers and how to avoid or prevent a disaster. In addition, OSHA also offers educational materials and training to help businesses educate their workers and to comply with the Occupational Safety and Health Act. Working with electricity can be extremely dangerous when proper safety procedures aren’t observed. Electricians, engineers and other professionals work directly with electricity. This may include working on overhead power lines, cable harnesses, and repairing or installing circuit assemblies. Other people, such as factory workers, office personnel and sales people work indirectly with electricity, which may expose them to electrical hazards. Ever since it was invented, electricity has been regarded as a serious workplace hazard. The OSHA electrical standards have been designed to protect employees exposed to potential dangers such as electrocution, electric shock, explosions and electrical fires. 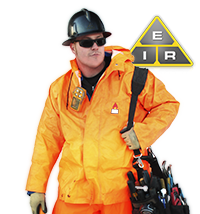 Electrical hazards in specific industries are addressed by these standards. Electrical protective devices (1910.137) – This standard requires that all insulating blankets, covers, matting, gloves, line hoses and sleeves made of rubber be seamless and marked with the appropriate Class designation. Electric power generation, transmission, and distribution (1910.269) – This standard covers the proper use and maintenance of electric power generation, transformation, control, transmission and distribution equipment. A conductor being used as a grounding conductor must be recognizable and clearly distinguishable from all other conductors, green in color. Conductors used to ground equipment must be recognizable and clearly distinguishable from all other conductors, green in color. Polarity must be maintained. A grounded conductor may never be attached to any terminal or lead that is live. A grounding terminal or grounding prong on a receptacle, cord, or any attachment plug may not be used for any other purpose than grounding. OSHA safety training is all about training employees how to stay safe at work. It is the employer’s responsibility to make sure standards are observed and job assignments are limited to workers qualified or certified to do the job assigned. It is OSHA’s belief that health and safety training is essential in preventing accidents and work-related illnesses. In general, experienced and properly trained workers have fewer accidents than those who are new to the job. Training employees how to properly perform the job at hand is time and money well spent. Companies regard OSHA safety training as an investment. Effective health and safety training programs result in fewer accidents and illnesses, higher morale amongst workers and lower insurance premiums, as well as many other benefits. The first step a company takes is determining what the problem is and whether or not it can be solved with better training. When employees aren’t performing certain jobs properly, a lack of training is assumed to be the problem. However, in some cases it is the equipment causing the problem. Ideally, employees should be trained right after being hired, before accidents or problems occur. Training should include general workplace safety and specific job safety rules and procedures. In the event of an accident or near miss, the employee should be given a refresher safety class. Training effectively solves problems caused by the lack of knowledge about proper work processes, unfamiliarity with machines or equipment, and from performing the job incorrectly. Problems caused by an employee not paying close enough attention or being careless probably won’t be solved by training, but it may help. Once it is determined that training will solve the problem, the next step is to decide what training will be most effective. This can be done by analyzing the job and observing how the employee performs the job. This will help pinpoint what an employee needs to know in order to do the job in a safer way. When creating a new training program, or planning the best way to instruct an employee unfamiliar with a certain system or procedure, an employer can determine how the job should be performed by examining the specifications provided by the equipment manufacturer or the safety data of unfamiliar substances. Specific OSHA safety training standards can also be applied in order to develop a good training program. Another option is to do a job hazard analysis. This involves observing each step of a particular job and recording how the employee goes about his duties. Careful observation will help to identify potential safety hazards and determine how to perform the job in a way that will reduce or eliminate the risk. This information can then be turned into a valuable OSHA safety training session.